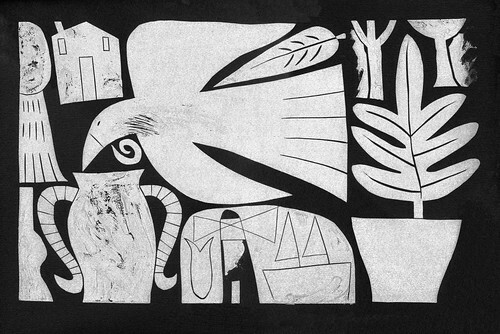 Impact7 International Printmaking Conference is less than 2 months away! They have just updated their website with the programme, and participants who are speaking. Congratulations to you all! I'm looking forward to hearing more about your topics. hopefully the lists of Demonstrations and Exhibitions will be next! by a selection of printmakers from around New Zealand. 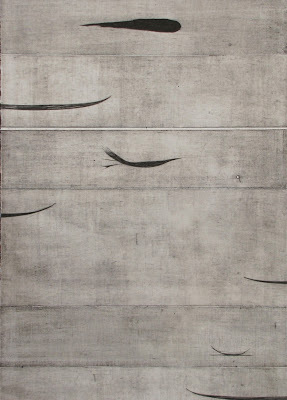 Works have been selected from private collections to demonstrate the wide scope of printmaking. Rebecca White, Joash Daly, Kathryn Madill, David Brebner, Kate Logan and more. $25 per person including materials, click here for more details on registering. which will feature informal curator, artist talks and hands-on activities for all ages. ...and we can always do with a little extra inspiration occasionally. "emerging and talented printmakers from across the globe"
to exhibit and sell their work both online and at shows. in order to develop a global community in the world of print. as I know you all love seeing what's new with print and design. I really enjoyed the opening of How Could We Resist? last night in Mt Eden, Auckland. and some lively discussion about processes and 'favourites'. Anna Nelson, Hilary Ramage, Basia Smolnicki, Joan Travaglia, and many more! before all the 'favourite' prints find new homes. gallery representation in NZ, fully optimised dedicated web page for one year. Representation may be offered to more than one artist. The entry fee is NZ$50 for NZ residents, or NZ$70 for international entries. This covers return postage and catalogue, admin and exhibition costs. and the deadline for submissions is 1 November 2011.
and register by this Sunday 31 July. I'm keen to find out how many of you NZ Printmakers are contemplating going. will be exhibited at Solander Gallery in Wellington from 29 July - 3 September. The opening event is on this Friday 29 July from 5.30-7pm. 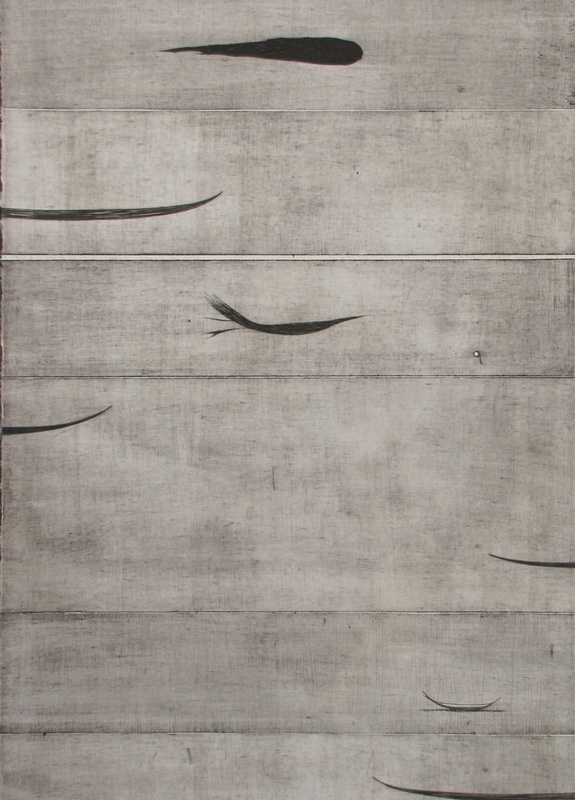 in large scale intaglio woodcut works of serene beauty. tree and water infuse these works with symbolism. in relief works of stylized oriental patterns. 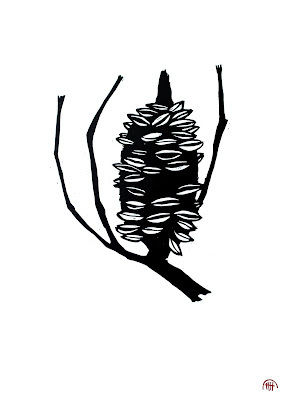 Karen Stevens finds inspiration for this new body of dramatic woodcuts in the simple forms of seedpods. intricacy and the circumstances of their chance discovery. Check out www.solandergallery.co.nz for more information about location and opening hours. A week or so ago, when I was in the Middle East, I visit the Jerusalem Print Workshop. with a very interesting variety of prints of diverse colours, textures and imagery. You can also check out some other print artists they represent here on their website. With several hours to wait I decided to see what they were up to. To my surprise they were making prints! The materials were provided by Singapore Airport. Where is the most unusual place you have seen printmaking??? called The Violet Hour on display now in Christchurch until 13 August. See PaperGraphica's website for more information. The exhibition contains original works of art by printmakers from all over New Zealand. 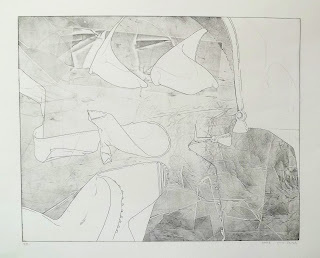 mezzotint, intaglio, relief, monoprint and screenprint. after previous shows in Whanganui, Pirongia, Hamilton, Taupo, Greymouth and Blenheim. so get in early to select from all the available works. Who are you and how did you become a printmaker? Born in Auckland New Zealand with Croatian Heritage. on my overseas experience while living in the UK. to contemporary art on a visit to the Tate Modern in London. (or 'good art') was very narrow... and that was realism. and of course worked hard to develop my own artistic career. 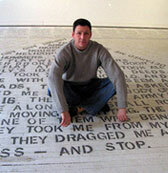 as another way to express my creative ideas but also to get my work out to a larger audience. I was lucky enough to meet two of NZ’s top printmakers, Tony Ogle and Michael Smither. even offering to teach me a little of the vast knowledge they have attained – this was so helpful. I have only tried screen printing to date and I love the whole process. and transferred onto light sensitive emulsion within screens. I have increasingly started introducing more ad hoc decisions during printing. the artwork may actually change during the printing process. to give each print in the edition its own individuality. Describe your most memorable printmaking moment. It would have to be creating my first screen print and seeing the edition sell out. is that the entire 80 or so prints are completed up front and of course that costs a lot. So seeing an image really resonate with the art buying public is such a pleasure. I’ve been lucky enough to have a few of these and I don’t take it for granted. I am strongly influenced by the Pop artists of the US in the 1960’s like Lichtenstein and Warhol. I love the fact they took everyday things and made them into fine art – genius. Bill Hammond, Michael Smither, Gordon Walters and Max Gimblett. Can you offer one small piece of advice to share with other NZ Printmakers? Keep producing! Ignore the tall poppies or the knockers. Also, if an edition doesn’t go as well as you’d hoped just keep going. Your next print could be your best. with lots of people who have very similar interests to me. there will be an event this week on Friday 22 July at 1pm. in Wellington on Sunday 28 August. 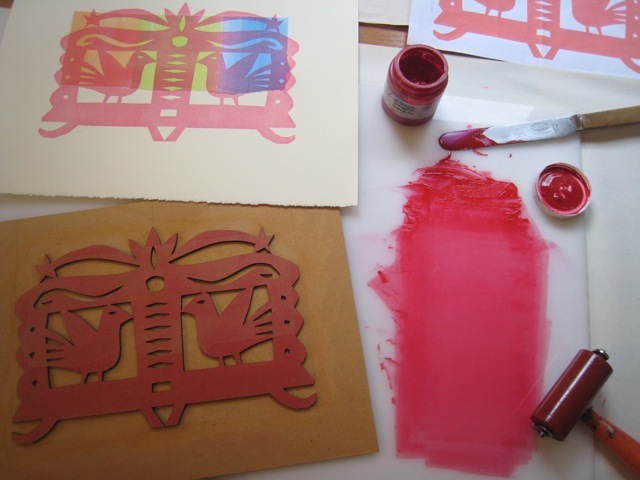 The workshop will introduce techniques to create exciting and dynamic woodcut prints. to create a strong graphic image of your own design. Cost $130 including all materials and equipment. both in art and other aspects of craft & design. 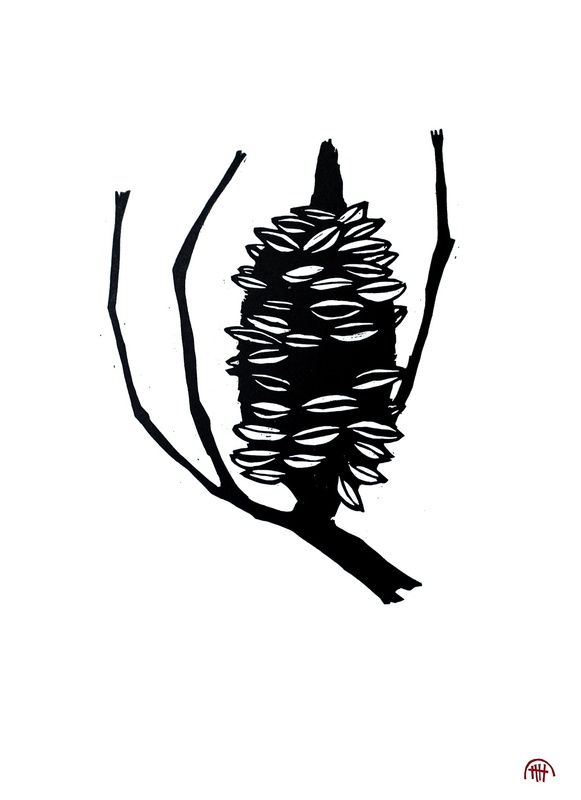 Here's a little intro to Basia Smolnicki, a very interesting artist based in Wellington. 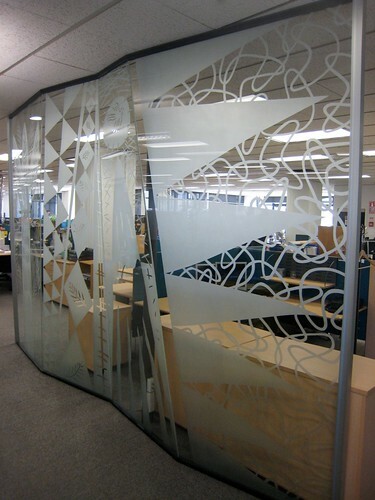 I recently saw images of these glass works, installed in an open-plan office at the Ministry of Health. and in keeping with the style and look of her other image-making. inside and outside of galleries. because of the many print possibilities that can be either worked by hand or using new technology. I have a traditional etching press and a computer in my studio. creating masks and stencils for new work and looking at the layering of the artwork. Either I'm mixing real pigments by hand, or on my computer manipulating pixels and vector shapes. How did you come to be a printmaker? while studying Visual Communication at Wellington Design school in the 1980s. when I met my husband architect Paul Kerr-Hislop. to introduce images and iconography into the architectural environment. 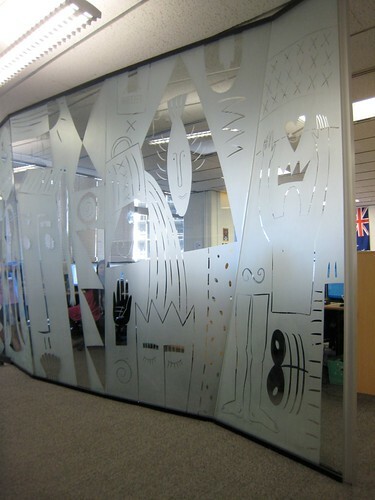 and the final third producing sandblasted designs on glass as commissioned artworks. I've often been asked what my work is - craft, design, or ʻinstallationʼ? I'd like to think of it is a hybridisation of contemporary art that explores these boundaries. but it has evolved into something between fine art and applied design. allows for maximum natural light to reach an otherwise dark room in the middle of a house. Architectural renovation designed by Paul Kerr-Hislop and artwork by Basia Smolnicki. just using a different medium. transforming it into a shattered, rough textured glass surface. and even colored ʼcathedralʼ glass. Once installed the glass comes to life when light is directed through the glass plane. 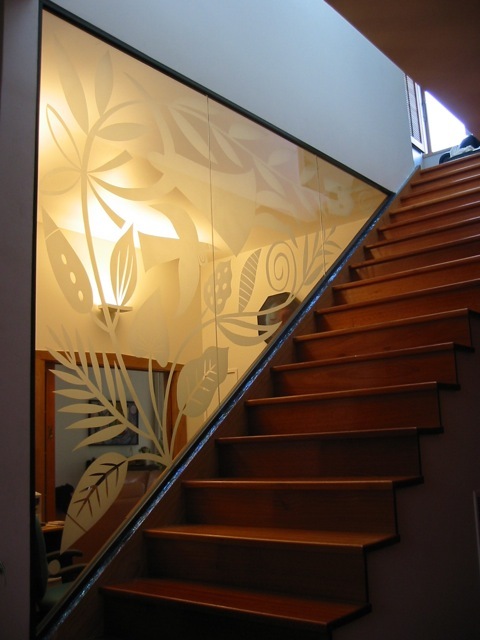 Sometimes clients have asked me for sandblasted designs on panes of glass already installed. I have found a stick-on vinyl that closely resembles the sandblasted glass effect. and then digitised ready for laser cutting. I can then take the laser cut vinyl to the site and apply it carefully to the pane of glass in situ. with or without using aquatint methods. combined with collaged hand-colored paper on Magnani Pescia yellow paper. My latest project is exploring my Polish heritage, Mum & Dad arrived in NZ after WW2. and then digitised ready to laser-cut a wood block from MDF board. The wood blocks are based on decorative and traditional Polish paper cut outs, but with a kiwi twist. collaged with hand-painted coloured papers for a simple but multi-coloured print. and you can see more images of Basia's artworks and glass installations on her Flickr gallery. on this coming Saturday 9 July at 1pm. through published posters, magazines and leaflets, including lobbying against apartheid. and the importance of print to communicate their message.